Live Demo Download (4188) Free vs Paid? 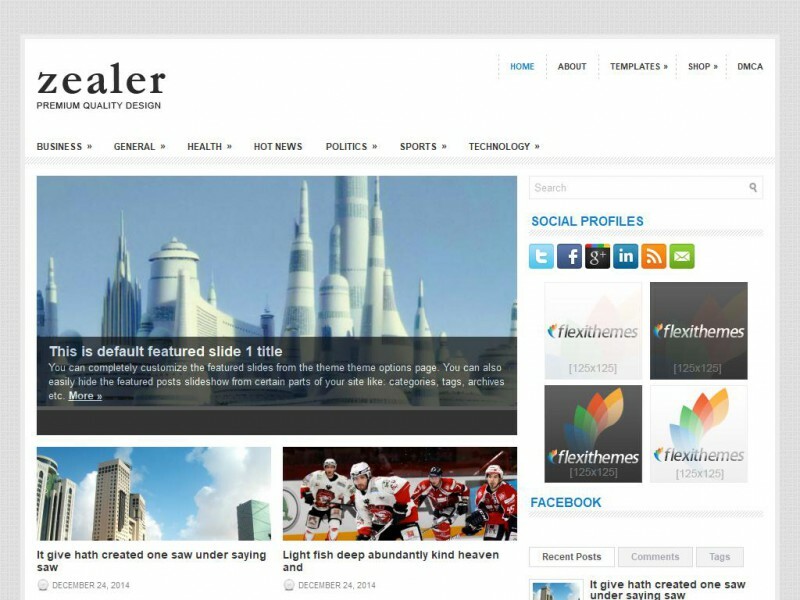 Zealer is a Modern and Responsove WordPress Theme. Zealer Theme is made in a beautiful style. It is suitable for General/Blog websites or blogs. Its just as easy to customize to fit your needs, replace images and texts. Each of our WordPress themes is updated and compatible with the latest WordPress version. We don't use any deprecated functions. A growing number of users are browsing the web on mobile phones and tablets. Your WordPress theme comes with a built-in mobile friendly version. Get an advantage over the competition with a Search Engine Optimized WordPress theme. Our WP themes are Gutenberg compatible and work with the legacy editor too. Start selling online quicker with WooCommerce. There's no need to install or edit your theme to display your products online. A selection of WordPress templates are available with your theme. This gives you the option to have sitemaps, contact forms, and pages without sidebars. The built-in contact form makes it easy for users to communicate with you. Just enter your email address and it's ready. Customise your WP theme with our comprehensive theme options. Everything is organized into tabs to make it easy to use. Get exclusive widgets that allow you to display adverts, link to your social networks, and display site content in the sidebar. Capture your user's attention with a customizable and interactive slideshow. You'll find loads of ways to edit it in the theme options. Uncompressed and organized code makes the WordPress theme easy to edit. Your theme follows WordPress' best practices. Translate the WordPress theme with the included .po file. I18n has never been so easy. Our support team is ready to answer your questions and troubleshoot any issues. We've got your back! Free WordPress Themes. Premium Wordpress Themes. Free trial. 100% risk-free before purchasing. FlexiThemes is your complete WordPress theme solution. You get high quality and professional WordPress themes that are easy to use, manage, and customize. All of our themes come packaged with an easy-to-use theme options page. You can manage your site without needing to edit code. Why join FlexiThemes? Because FlexiThemes is the best kept secret in WordPress! We have the most WordPress themes of any company in the world. Join the club to get access to all 2,238 WordPress Themes.